Happy Sunday! I am on my way back from Greenville, South Carolina today and although I loved getting to see friends and spend time with them, I am looking forward to being back in the comfort of my own room. While home will always feel like Fairhope, AL to me, my bed in Birmingham is definitely more comfortable which has me excited to get back to it. Speaking of comfort, I’m not sure if anything helps me to feel quite as at home as curling up in my pajamas under a cozy blanket. Blankets are one of those things that I don’t necessarily feel like you can have too many of. This feels especially true for my roommate and I currently since we have two living rooms, a guest room, and an outdoor space that all feel more put together and inviting with blankets used as practical décor. 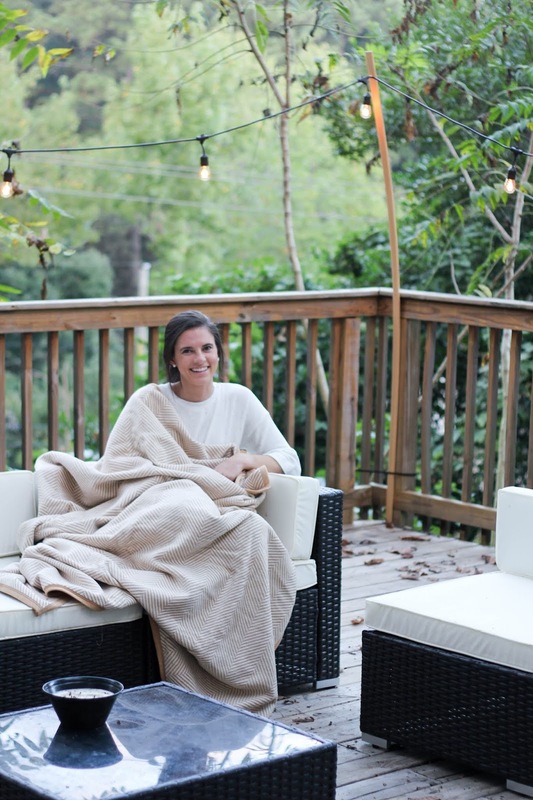 Finding blankets that are cute but also practical for our outdoor space was a challenge until I remembered ChappyWrap and their beautiful, oversized blankets. Not only are the design options plentiful, but also the blankets are machine washable making them the perfect addition to our outdoor space. 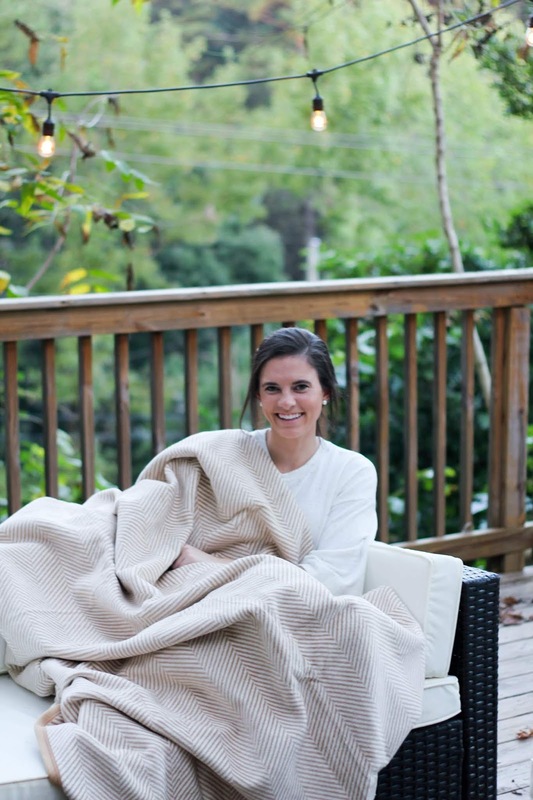 ChappyWrap was started based on a desire to discover a blanket that resembled the founder and her siblings’ favorite childhood blanket. What was found after asking questions and doing a lot of digging was that many blankets available in the U.S. were lacking quality. 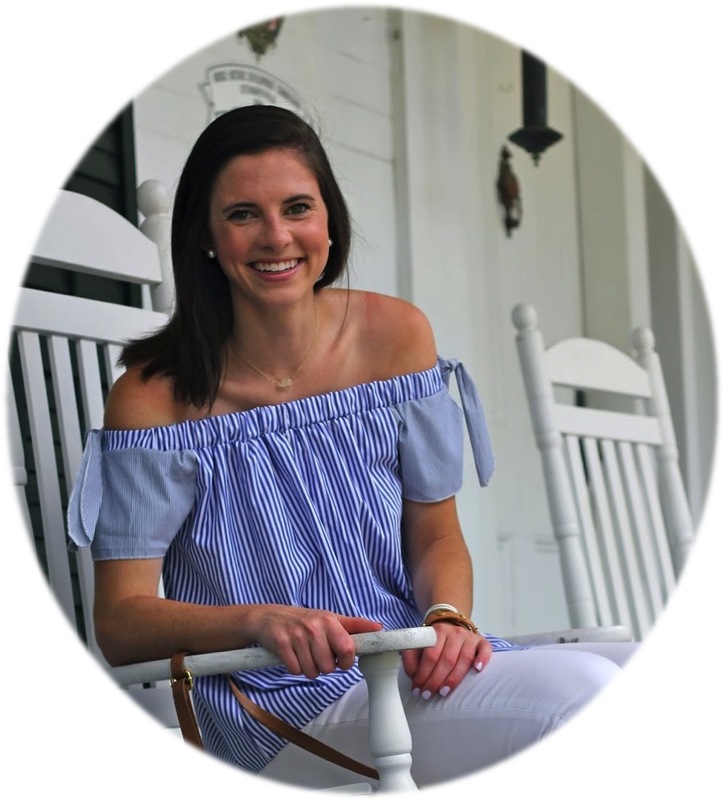 That’s when Beth set out on a mission to find a way to produce high-quality blankets made from a plush, natural blend of cotton and high-performance fibers, as opposed to synthetic polyester or polar fleece. Today, ChappyWrap has become a family business aimed to spread comfort to everyone, everywhere with the best blankets in the world. With so many beautiful prints, choosing one can be quite the challenge. Since I wanted my ChappyWrap to be something that could be used in a variety of spaces I ultimately decided on the Harborview Herringbone Beige Blanket and Throw. There is something about a classic herringbone that is hard to beat. Since setting up our deck to also be a place to watch movies I knew just the place to test it out. 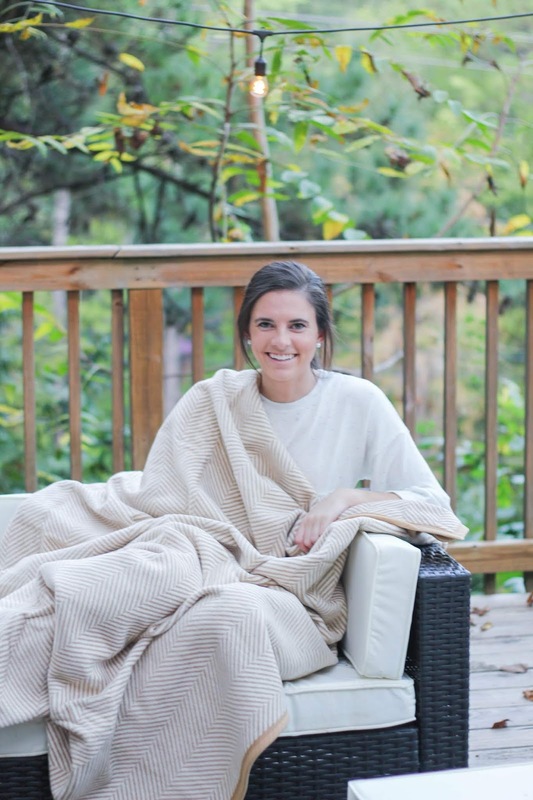 With our projector set up and a movie ready to go, this blanket was the perfect way to stay cozy even outside as the temperatures drop. Fortunately for friends, the size of the blanket will even allow me to share so that they don’t have to be cold when opting to watch movies and football outside either. And once we have retreated back indoors, I can easily toss it in the washer knowing that it won’t shed, pill, or fizz and will be clean for its next use. Since this is a Sunday Spotlight that means that tonight on Instagram you’ll have the chance to enter to win your own ChappyWrap. As an added entry, head to their site and let me know which print you would choose and comment it below! I wish I had a little outdoor patio like this! The wrap looks perfect for fall, so cosy! Harbor tides or the herringbone! Love a good neutral and can’t sit without a good blanket!! I agree with you and love the Harborview Herringbone as well! It’s a classic that can be used anywhere at anytime and will never go out of style! I’ve wanted one of these blankets for so long!! Crossing my fingers for the giveaway!!! 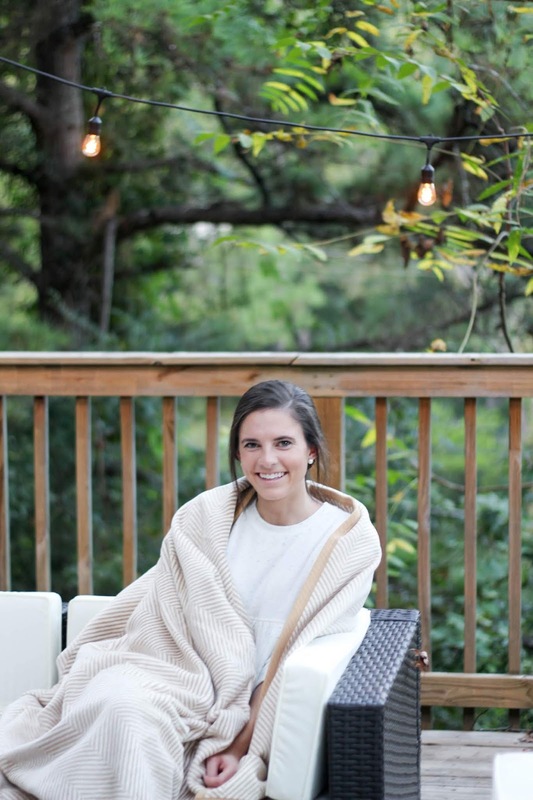 I love the Harborview Herringbone Beige Blanket and Throw! Such a versatile one that can be used anywhere to instantly make the space cozier! Eyeing the Harbor Tides pattern 😍 Thanks! The Harbor Tides pattern is such a fun twist on a classic design and would look so good in my dorm room!